As many of you know, this year marks a big transition as I fully embraced Outdoor Afro as an important part of my purpose, and since, the quality of my life has improved as it allows me to spend more time enjoying my family, and nature! But beyond the scope of my personal life, for me Outdoor Afro represents a chance to help make a positive difference for the world, and I am grateful for each friend and colleague who believed in this vision and cheered me on. Outdoor Afro was humbled by the tremendous media recognition this year, including ABC, CBS, and Backpacker Magazine. I was especially floored, and a little more than tickled to make The Root 100, where I was recognized as one the most influential African Americans in the country and later to receive a humanitarian award by Hidden Villa Ranch. 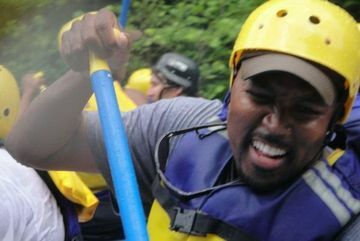 Each of these moments helped to push the message that black people do have a relationship to the outdoors, and show the ways we each can take meaningful action that gets more people connected to nature. We are sustained by the many partnerships we have formed since Outdoor Afro began, and thrilled about our new corporate partners, KEEN footwear, REI, and Clif Bar. I have also enjoyed working on important projects this year with NAAEE, EE Capacity, The Children and Nature Network, Golden Gate Audubon Society, the Georgia River Network, the Maryland Coastal Bays, California ReLeaf, Akiima Price Consulting, the Oakland Museum of California, National Wildlife Federation, Camp-California; the RV community, and many public speaking opportunities that have helped me to further the work of connecting more people to nature in ways I never imagined. But the work and community of Outdoor Afro depends on the support and involvement of each of you. This includes all of you who join our conversations on Facebook, Twitter, (Retweeting, Liking, Sharing), or attend our many fun events all around the country – each action and each one of you matters! And you don’t need an afro to be involved! So thank you Outdoor Afros for a fabulous 2012. Please join me now to celebrate our success, and spread the world to help more people live better lives through meaningful connections to nature.